Once upon a time, mobile device management simply meant developing policies for employees who brought their own phones and logged onto your network. How times have changed! Today, mobile device management goes far beyond just one device for one employee, extending throughout your whole company and touching every employee. Do you have policies and plans in place to meet your user’s needs while keeping those devices—and your company’s sensitive information—secure? 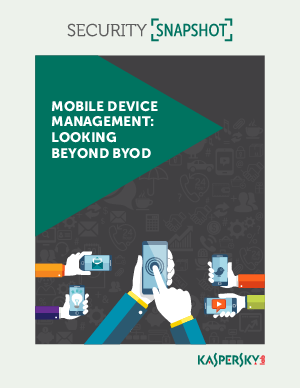 Download Kaspersky Lab’s Snapshot Mobile Device Management: Looking Beyond BYOD, to find out the answers to these and other questions.